"Those mischievous bunnies are back in a hilarious sequel, a party comedy game that is guaranteed to be even crazier and funnier than the first with even more insane games to play. Rayman Raving Rabbids 2 will push the envelope of the Wii gameplay experience by continuing to make innovative use of the Wii Remote™. It will deliver fun, intuitive games that feature the wacky humor that Rayman and the Rabbids are known for. 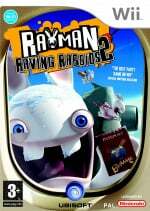 In development at Ubisoft’s Paris studio, Rayman Raving Rabbids 2 is scheduled for a fall 2007 release." The game will contain 60 brand new games that "spoof popular culture and are even wackier", adding even more new ways to use the Wiimote. Rayman will this time travel between 5 different regions such as USA, Europe and Asia battling "regional rabbids". Again the game will feature a multiplayer mode where you can play any mini game unlocked from the single player adventure. Ubisoft state the game is set for release this calendar year, a more specific date will be announced soon. All I can say is... BWAAAAAAAAAAAAAAAAH!